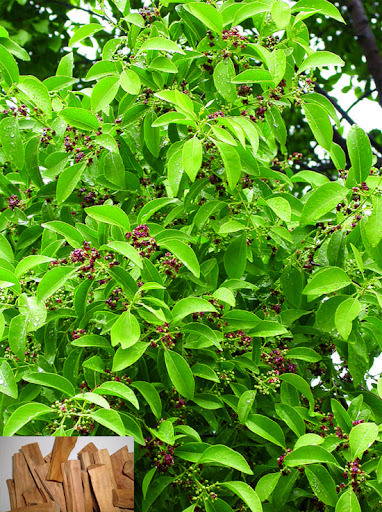 Common Name: Santalum, Sandal wood, Heartwood of sandalwood. Lignum Santali Albi is produced chiefly in the provinces of Guangdong, Yunnan, and Taiwan, and is also grown in southeast Asia, India, Australia, and Africa. It can be collected during every season, but the wood collected in summer is the best quality. After being cleaned, it is cut into slices or pieces for use. Functions: 1. To regulate qi in the spleen and stomach; 2. To dispel cold and stop pain. 1. Cold and qi stagnation manifested as epigastric and abdominal pain and vomiting with clear fluid. Sandalwood (Tanxiang) is used with Amomum fruit (Sharen) and Lindera root (Wuyao). 2. Angina pectoris and coronary heart disease. Sandalwood (Tanxiang) is used with Corydalis tuber (Yanhusuo) and Asarum herb (Xixin) in the formula Kuanxiong Wan. Dosage: 1-3 g, decocted in water, or ground into powder for an oral dose.